C2B: Consumer/Customer to Business. Customized and tailor-made products are provided just for you! If you are not satisfied with the products provided here or if you don’t like what offers here, please tell us what exactly you need and your specific needs and demands, such as size, color, weight, usage, purpose of buying, your budget, quantity, quality request, other requirements, and we will customized design and tailor-made produce just for you! Please click ⌈Contact Seller⌉ button on each product page to write down all your detailed needs and demands, the seller will respond you as soon as possible! Or you can directly type your detailed needs and demands in the ⌈Leave a Reply⌋ box below! Thanks for your time and participation! Your satisfaction is guaranteed! We’re listening, so please tell us what you need exactly in the ⌈Leave a Reply⌋ box below! In contrast with the more traditional business-to-consumer model, the C2B (consumer-to-business) model allows businesses to extract value from consumers – and vice versa. In the C2B model, businesses profit from the willingness of consumers to name their own price or contribute data or marketing to the company, while consumers profit from flexibility, direct payment, or free or reduced-price products and services. Brent Walker, vice president and CMO at C2B Solutions, says the distinguishing feature of C2B is that customers bring value to the company. “This could involve consumers co-creating ideas, product/service concepts and solutions with a company through social media. C2B can also mean that a business brings consumer insights and consumer-centric solutions to another business as its primary service or value-added offering,” Walker told Business News Daily. C2B business models include reverse auctions, in which customers name the price for a product or service they wish to buy. Another form of C2B occurs when a consumer provides a business with a fee-based opportunity to market the business’s products on the consumer’s blog. For example, food companies may ask food bloggers to include a new product in a recipe, and review it for readers of their blogs. YouTube reviews may be incentivized by free products or direct payment. This could also include paid advertisement space on the consumer website. Google Adwords/Adsense has enabled this kind of relationship by simplifying the process in which bloggers can be paid for ads. Services such as Amazon Affiliates allow website owners to earn money by linking to a product for sale on Amazon. The C2B model has flourished in the Internet age because of ready access to consumers who are “plugged in” to brands. Where the business relationship was once strictly one-directional, with companies pushing services and goods to consumers, the new bi-directional network has allowed consumers to become their own businesses. Decreases in the cost of technologies such as video cameras, high-quality printers and Web development services give consumers access to tools for promotion and communication that were once limited to large companies. As a result, both consumers and businesses can benefit from the C2B model. For the C2B relationship to be fulfilled, the participants must be clearly defined. The consumer could be any individual who has something to offer a business, either a service or a good. Examples could be a blogger, as mentioned before, or a photographer offering stock images to businesses. The consumer could also be someone answering a poll through a survey site, or offering job-hiring services by referring someone through referral hiring sites such as elance.com. The business in this model could be any company planning to buy goods or services from individuals either directly or through an intermediary. An intermediary would connect the business that needs a service or a good to the mass of individuals, acting as a portal both for buyers and sellers. The intermediary promotes goods and services through distribution channels, and gives individuals promotional, logistic and technical expertise. For example, the intermediary could be a company looking to fill a job through a referral hiring site, a company seeking to advertise online through Google Adwords, or a company that needs individuals to take surveys and provide market research. Because C2Bs are relatively new, underlying legal issues such as how to bill and receive money have yet to be fully sorted out. A traditional firm would pay wages to a limited group of employees, but C2B businesses could potentially have to process thousands of customer payments. Fortunately, intermediaries often take care of the financial and legal aspects of C2B transactions. Services like PayPal and Google Wallet ease the burden of payment, and Google Adsense pays webmasters by sending them checks in dollars, incurring shipping fees for Google and currency conversion fees for international users. Growing your C2B business requires dedication and a few special skills. “B2B typically relies on its sales function and account management team to establish and strengthen customer/client relationships,” Walker said. Market research (quantitative surveys, qualitative interviews, segmentation). Consumer feedback channels, such as rating and reviews, customer service lines, avenues for suggestions/comments. Social media, such as online consumer user communities, Facebook pages, Twitter followings, etc. “Marketing may include advertising in trade journals, having a presence at conventions and trade conferences, digital marketing (online presence, SEO, email outreach) and other traditional awareness efforts,” Walker said. C2B is a new and growing segment of the business market that can function as a company’s entire business model, or that can augment an already successful venture. As in all models, your company’s success will depend on your thorough understanding of the marketplace and your willingness to pursue new technologies that make reaching your customers easier than ever. “Pursuing a C2B approach is a strategic choice and requires a commitment to involving the consumer in business decisions. This takes extra effort, resources and discipline to avoid being internally focused, but it is critical for a business to succeed in a consumer-driven marketplace,” Walker said. Over the past few years there has been a lot of press around B2C (Business to Consumer) and B2B (business to business) business models. Ebay introduced C2C (Consumer to Consumer) which has proven to be another successful business model. Today B2E (Business to Employees) and C2G (Consumer to Government) models have become the new trend. The latter model includes applications like internet based or electronic voting. But what about C2B ? C2B is a business model in which consumers (individuals) offer products and services to companies and the companies pay them. This business model is a complete reversal of traditional business model where companies offer goods and services to consumers. Connecting a large group of people to a bidirectional network has made this sort of commercial relationship possible. The large traditional media outlets are one direction relationship whereas the internet is bidirectional one. Some models are mistakenly associated to C2B. This is the case of some price comparison sites like Kelkoo, froogle and even Priceline.com. They offer a different type of consumer and company relationship than a traditional B2C model provides but cannot be clearly defined as true C2B business models. Indeed, demand is still directed by the consumer; supply provided by the company, nothing really innovative. There are only a few kinds of companies whose trading models could be considered as C2B. Online Advertising sites like Google Adsense, affiliation platforms like Commission Junction and affiliation programs like Amazon are the best examples of C2B schemes. Individuals can display advertising banners, contextual text ads or any other promotional items on their personal websites. Individuals are directly commissioned to provide an advertising/selling service to companies. Online surveys (GozingSurveys, Surveyscout, and Survey Monkey) are also typical C2B models. Individuals offer the service to reply to the company’s survey and companies pay individual for this service. Blogs have paved the way for news C2B and C2C applications by giving the opportunity and tools to anyone to express themselves easily and to communicate inexpensively. For instance, Nano-publishing is a concrete application of C2B and C2C schemes using a blog as a support medium, amateurs talk about precise subjects concerning their area of expertise through vertical blogs and are remunerated per published posts or commissioned on advertising or affiliation revenues generated by traffic on their blog (ex : Gizmodo.com) . Podcasting, video casting, RSS and other blog related technologies help to provide opportunities to develop new economic systems and to generate alternative revenues. Platforms like Fotolia or Google Video are also very good examples of emerging C2B Models. On these websites, anyone is able to sell digital contents (photos, images, icons, animation, and video) to companies. Creative Digital Content is perfect for C2B business because it uses simple and cheap technologies (no production cost), can be easily shared (no logistics cost) and are not perishable (no stock cost). This new kind of relationship between consumers and companies introduces new issues which are not yet defined by any law or classical scheme. For example, in C2B models individuals are required to bill and receive money legally. Billing is not straightforward without creating a company. For companies to pay individuals is not straightforward either. A traditional firm must pay wages to employees, a limited homogeneous group of individual whereas C2B intermediaries have to deal with a potentially heterogeneous group of individuals and must overcome problems such as: relatively high fees for low payments, diverse payments methods, varied languages, currencies and locations. To overcome these obstacles, different solutions are available. For instance, Google Adsense Program pays Webmasters by sending them checks in dollars, incurring Shipping fees for Google and currency conversion fees for non-US users. Some companies use wire transfers to remunerate their affiliates or members. However, not everyone is willing to provide their account information and international wire transfers are still very expensive. Some emergent online based payment solutions are more appropriate for this model. The companyPaypal offers a solution enabling payments between individuals and companies or between two individuals via a virtual account identified by an email address. This kind of solution will certainly be more and more popular with the development of C2B or C2C applications. They offer the cheapest and most practical way to send money to anyone anywhere. The new C2B business model is a revolution because it introduces a new collaborative trading scheme paving the way for new applications and new socio-economical behaviours. Who are the C2B Actors ? 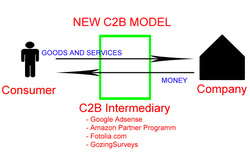 C2B business models like most of C2C models like Ebay are based on 3 players: a consumer acting as seller, a business acting as buyer and an intermediary dealing with the connection between sellers and buyers. The Intermediary is the crucial element since it creates the connection between business which needs a service or a good and a mass of individuals. Intermediary is usually a portal both for buyers (businesses) and seller (individuals). We can notice that some intermediaries prefer creating two different accesses one for buyers and one for sellers (Google Adwords for advertiser – Google Adsense for web publisher) whereas other companies like Fotolia have only one access because buyers and sellers can be the same. Intern intermediary: they play the role both of business and intermediary. For example, it is the case of amazon.com through its affiliation program. Amazon pays individual to promote its own products. Intermediary Examples What do they sell? What is the famous C2B model in eCommerce? A consumer-to-business model, or C2B, is a type of commerce where a consumer or end user provides a product or service to an organization. It is a reverse of the B2C model, where businesses produce products and services for consumer consumption. The idea is that the individual/end user provides a product or service that the business can use to complete a business process or gain competitive advantage. An example of this would be if a consumer provides a business with a fee-based opportunity to market their products on the consumer’s blog. A C2B business model would be formed if a food company began paying a food blogger to market their products, for example. A website owner could be paid to review products or services, whether through blog posts, videos or podcasts. This could also include paid advertisement space on the consumer website. Google Adwords/Adsense has enabled this kind of relationship by simplifying the process in which bloggers can be paid for ads. Another possible form of C2B is when a consumer specifies a need and various businesses bid to fulfill that need, such as referral hiring sites. For the C2B relationship to be fulfilled, the players must be clearly defined. The consumer could be any individual who has something to offer a business, either a service or a good. Examples could be a blogger, as mentioned before, or a photographer offering stock images to businesses. This could also be someone answering a poll through a survey site, or offering job hiring service by referring someone through referral hiring sites. C2B model involves a transaction between consumer and business organization. It is similar to B2C model but the difference is that in this model Consumer is the seller and Business Organization is buyer. In this kind of model Consumer decides the price of particular product rather than the Business Organization. This model is most applicable where consumers sells services. The famous C2B model in eCommerce are the Hiring Websites where businesses pay to get a service and consumers decide the salary is acceptable or not. Consumer-to-business (C2B) is a business model in which consumers (individuals) create value and businesses consume that value. For example, when a consumer writes reviews or when a consumer gives a useful idea for new product development then that consumer is creating value for the business if the business adopts the input. Excepted concepts are crowd sourcing and co-creation. C2B model, also called a reverse auction or demand collection model, enables buyers to name or demand their own price, which is often binding, for a specific good or service. The website collects the demand bids then offers the bids to participating sellers. Another form of C2B is the electronic commerce business model in which consumers can offer products and services to companies, and the companies pay the consumers. This business model is a complete reversal of the traditional business model in which companies offer goods and services to consumers (business-to-consumer = B2C). We can see the C2B model at work in blogs or internet forums in which the author offers a link back to an online business thereby facilitating the purchase of a product (like a book on Amazon.com), for which the author might receive affiliate revenues from a successful sale. Elance was the first C2B model e-commerce site. The internet connecting large groups of people to a bidirectional network; the large traditional media outlets are one-directional relationships whereas the internet is bidirectional. Decreasing costs of technology; individuals now have access to technologies that were once only available to large companies (digital printing and acquisition technology, high performance computers, and powerful software). C2B: Consumer/Customer to Business. Customized and tailor-made products are provided just for you! If you are not satisfied with the products provided here or if you don’t like what offers here, please tell us what exactly you need and your specific needs and demands, such as size, color, weight, usage, purpose of buying, your budget, quantity, quality request, other requirements, and we will customized design and tailor-made produce just for you! Please click ⌈Contact Seller⌉ button on each product page to write down all your detailed needs and demands, the seller will respond you as soon as possible! Or you can directly type your detailed needs and demands in the ⌈Leave a Reply⌋ box below! Thanks for your time and participation!